Anna Tsuchimoto accepts a Student of the Month plaque from Jordan Ivy, CVHS Dean of Students. Also there were Rotary Club of Castle Rock President Elaine Love, left, Tsuchimoto’s mother Brandi and sister Emi. 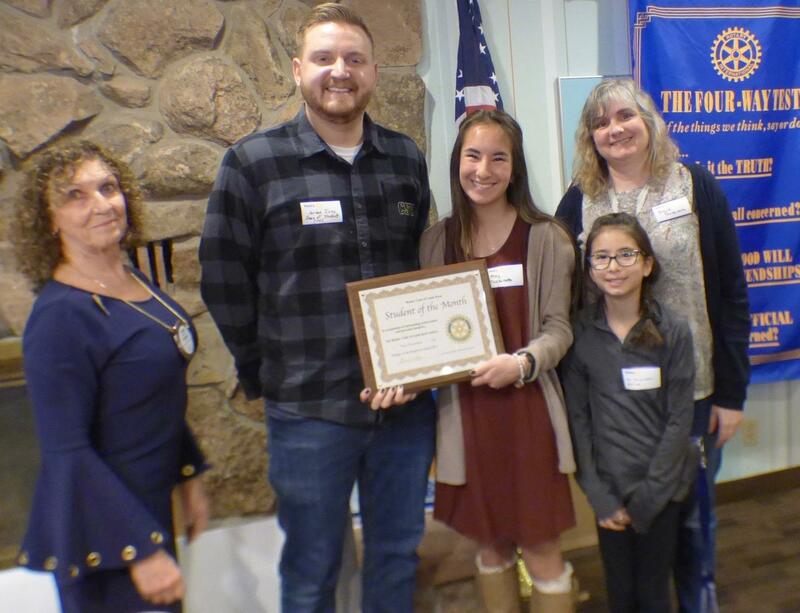 Anna Tsuchimoto has been selected as the March Rotary Student of the Month by the Rotary Club of Castle Rock. Tsuchimoto, a senior at Castle View High School, carries a GPA of 4.13 and has earned an academic letter all four years of high school. She has been in the National Honor Society for two years, has taken six Advanced Placement classes and has been in Honors Humanities in the 2015-2016 and 2016-2017 school years. Tsuchimoto was introduce to the club by CVHS Dean Jordan Ivy who said he was “blown away” by the student. “She is dedicated to the school and participates in a wide variety of activities to make her school and the community a better place,” he said. In addition, Tsuchimoto is on the tennis team, in the Trident Honor Orchestra, in the Interact Club and the Link Crew. She also participated in the Tri-State Buddhist convention and received a Colorado Asian Leadership Internship. Tsuchimoto said her favorite club in school was the Interact Club, a youth Rotary Club. She liked it, she said, because it was great to work with outside clubs to help others. She said she plans to attend the University of Arizona or San Diego State and she wants to be a doctor or a physician’s assistant.